Only 3 weeks ago news emerged that twin set 671+681 would be split with 671 envisaged to go into the LTT’s Thornton Gate Tram Museum while trailer 681 would make the journey to Birkenhead. However, this has now changed with both trams to head to Merseyside to operate on the Birkenhead tramway although it is still unknown as to whether they will eventually operate as a twin set or be rebuilt to operate singularly. The twin set will not be operating in passenger service anytime soon, and will only be able to operate after Merseytravel have successfully taken over operations on the tramway. Although the tramway was due to reopen in Spring, this was quickly declined by Wirral Borough Council with the re-opening date once again unknown. Later the same day a very dusty Brush 625 was picked up by the low loader and headed to temporary storage in Knowsley alongside 671+681 where it will also be used on the Birkenhead tramway in the future. Another of the growing collection at the Crich Tram Museum is Brush 630 which left for the museum on the 21st of December after being repainted into 1990’s green and cream. It joins Jubilee 762 in the works shed and are both being prepared for use in 2012. 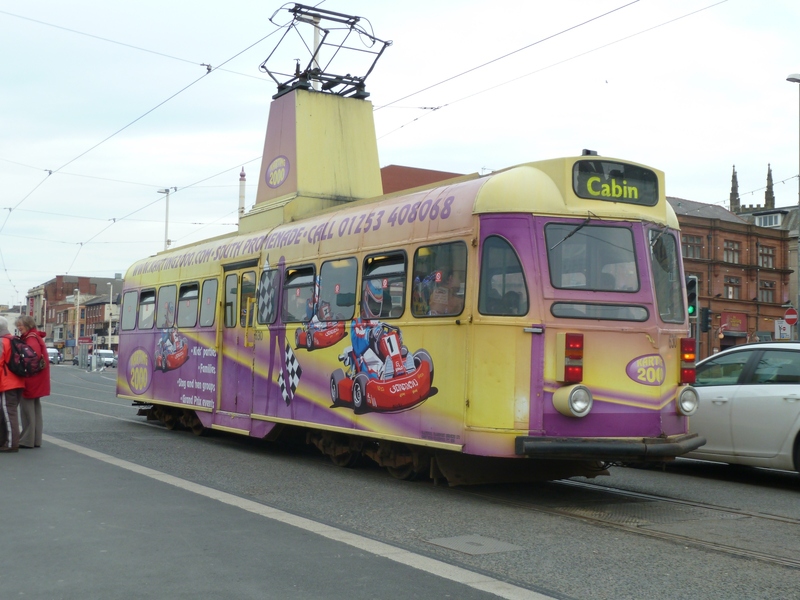 630 is seen at North Pier on the 24th of October carrying an advert for Karting 2000, two months prior to its final withdrawal in Blackpool. Plans for the new heritage museum at Thornton Gate have now been approved which is a major step forward for the LTT and the future of its trams. With the home of these trams now seemingly safe, trams are expected to make the move during 2013 as construction cannot yet begin as the LTT are entering the process of finding funds, and the site is currently occupied by Bam Nuttall who are carrying out work around the area in preparation for the resumption of service at Easter.